Nobody will protect you from your suffering. You can’t cry it away or eat it away or starve it away or walk it away or punch it away or even therapy it away. It’s just there, and you have to survive it. You have to endure it. You have to live through it and love it and move on and be better for it and run as far as you can in the direction of your best and happiest dreams across the bridge that was built by your own desire to heal. Cheryl Strayed (née Nyland; born September 17, 1968) is an American memoirist, novelist and essayist. Strayed’s personal essays have been published widely in national magazines and journals and have twice been selected for inclusion in The Best American Essays. She won aPushcart Prize for her essay “Munro Country,” which first appeared in The Missouri Review. Her second book, Wild: From Lost to Found on the Pacific Crest Trail was published in the United States by Alfred A. Knopf on March 20, 2012, and has been translated into more than thirty languages. From July 15, 2012, for seven consecutive weeks, it was No. 1 on the “New York Times Best Seller list” in hardcover non-fiction. 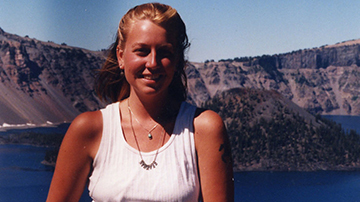 Cheryl Strayed is an Explorer. Cheryl Strayed is an Intellectual. Cheryl Strayed is a Creative.